Ramadan Paper Chain – Hello Holy Days! Cut the purple and gold sheets of paper into 2″ x 11″ strips. Fold the white paper multiple times over into a small rectangle; using a small circular object (like the cap of a glue stick or a coin) trace a crescent shape onto the paper. Cut the shape to reveal several crescents. You will need approximately 5 – 6 crescents on one strip of paper. On some of the purple strips, glue crescents and add gold star stickers. Assemble the paper chain by sticking a piece of double sided tape to one end of the paper strip and bending it into a circle. Continue to make the garland by interlinking circles. 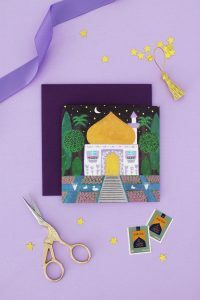 Alternate between gold paper, plain purple paper and purple paper with crescents and stars.